Up until now, I always made Strawberry Shortcake using scones that were cut in half and filled with fresh strawberries that were mascerated in sugar and whipped cream. While a real family favorite, sometimes I like to make it another way. What I do is to use two layers of a light and spongy Golden Chiffon Cake. I then sandwich the layers together with a flavorful Strawberry Compote and lots of Whipped Cream. It's so delicious, I just had to share this recipe with you. The Chiffon Cake was invented in the 1920s by a Californian named Henry Baker. It is a type of foam cake that contains both egg yolks and egg whites, along with baking powder and a liquid fat (in the form of oil). It is the oil that gives this cake its wonderful moist and tender crumb and keeps the cake soft even when refrigerated. Normally I bake a chiffon cake in a tube pan, but for this recipe I decided to use two cake pans. As with a tube pan, you don't grease the pans, because you want the batter to cling to the sides of the pans as they bake. Now, it's important to turn the cakes upside down immediately upon removing them from the oven so that the cakes won't shrink and lose their volume as they cool. 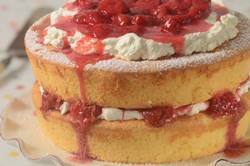 I really like using a Strawberry Compote as a filling for this Strawberry Shortcake. A Compote is kinda a cross between a strawberry sauce and a strawberry jam. It is wonderfully thick and syrupy with nice chunks of softened strawberries. It keeps well, up to 10 days, when stored in the refrigerator. Besides as a filling, it is delicious over ice cream, stirred into plain yogurt, or in a Fruit Smoothie. I have also spread it on my morning toast. Golden Chiffon Cake: Preheat your oven to 350 degrees F (180 degrees C) and have ready two - 9 inch (23 cm) round cake pans with 2 inch (5 cm) sides. Line the bottoms of the pans with parchment paper. In the bowl of your electric stand mixer, fitted with the paddle attachment, (or use a hand mixer) place the flour, 1 cup (200 grams) sugar (Sugar 1), baking powder, and salt. Beat until combined. Make a well in the center of the flour mixture and add the egg yolks, oil, water, and vanilla extract. Beat, on medium speed, until smooth (about one minute). Scrape down the sides and bottom of the bowl as needed. In a separate bowl, with the whisk attachment, beat the egg whites, on medium low speed, until foamy. Add the cream of tartar and continue to beat until soft peaks form. Increase your mixer speed to high and gradually beat in the 1/2 cup (100 grams) of sugar (Sugar 2) and continue to beat until stiff peaks form. With a large rubber spatula or wire whisk, gently fold the egg whites (in three additions) into the batter just until blended (being careful not to deflate the batter). Divide the batter equally between the two pans (about 560 grams in each pan) and bake for about 25 to 30 minutes, or until a toothpick inserted into the center of the cake comes out clean. (When lightly pressed, the cake will spring back). Immediately upon removing the cakes from the oven, invert the pans (turn the pans upside down) onto wire racks lined with paper towel. Let the cakes cool completely before removing from pans (about 1 - 1 1/2 hours). To remove the cakes from their pans, run a spatula around the inside of the pans and invert onto a wire rack. The unfilled cakes can be stored in an airtight container for a few days at room temperature or for about five days in the refrigerator. These cakes can also be frozen for a couple of months. Strawberry Compote: Place the cut strawberries in a saucepan, along with the sugar. Over medium heat, bring just to a boil, stirring occasionally. Reduce the heat and, stirring occasionally, let the berries simmer for about 10-15 minutes, or until the strawberries have softened and the juices are thick and syrupy. Remove from heat and stir in the lemon juice. Let cool and then place in a covered container and refrigerate until chilled. The compote can be stored in the refrigerator for 7 - 10 days. Whipped Cream: In the bowl of your electric stand mixer, fitted with the whisk attachment, (or use a hand mixer) place the cold cream and sugar. Beat just until firm peaks form. Assemble: Place one cake layer on your serving plate. Top with half the whipped cream and a layer of strawberry compote. Gently place the second cake layer on top of the first layer. Top with the remaining whipped cream and more strawberry compote. If not serving immediately, place in the refrigerator. The assembled cake is best served within a few hours, but can be covered and stored for a day or two in the refrigerator.